Why is the Nissan Altima the Most Stolen New Car in the United States? The National Insurance Crime Bureau released the data for the most stolen cars in the U.S. in 2017. While the number of thefts saw a rise of 1 percent over 2016, capping at 773,139 motor vehicle thefts across the country, the likelihood of car theft is far higher in some areas than in others. More interesting than that is the fact that the Nissan Altima become the most-stolen new car. Still, topping the charts of the most-stolen vehicles in the U.S. are the Honda Accord, Honda Civic, Ford pick-up trucks, and Chevy pick-up trucks. While most modern cars pack in the safety features and offer plenty of value-per-dollar, there are some out there that seem to stand above the rest. If you’re scouring the used market looking for just the right ride for your new driver, fear not, as we’ve put together a list that outlines ten models that are just a few years old, but still come with just about everything you could want. Each entry also includes a rundown on crashworthiness, as tested by the Insurance Institute for Highway Safety, or IIHS, a U.S.-based non-profit organization that conducts research on almost all new cars. So with that, read on for our list of the ten best-used cars for new drivers. Just as almost every automaker is stirring into the SUV skid, Nissan is stirring against it with the launch of the sixth-generation Altima. 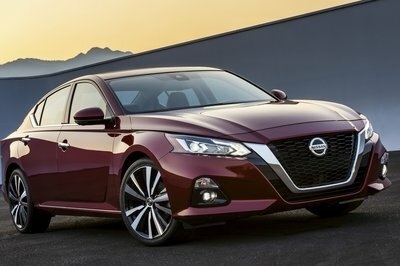 The Japanese auto brand is pulling out all the stops with the new version of the midsize sedan that, according to the company, represents “one of the highest investments in the history of Nissan.” The new Altima sits on a new platform, a new engine, and a new all-wheel-drive system. 15 years ago, before the age of tire pressure monitoring systems, we checked out tire pressure once a week when filling up the gas tank. From there we would proceed to add air to any of our car’s tires and go about our lives until the next fill-up unless we notice a tire looking a little low. Well, nowadays we have tire pressure monitoring systems that tell us when a tire drops below a certain pressure level. Nissan wants to take that a bit further, though and has introduced the Easy Tire-Fill alert system. This system essentially prevents the need for us to check tire pressure as we add air to our tires. It’s routinely simple, leave the ignition key on with the engine off and add air pressure. When pressure is right, the horn will honk. Overpressure the tire, and the hazard lights will kick on along with another quick honk of the horn. 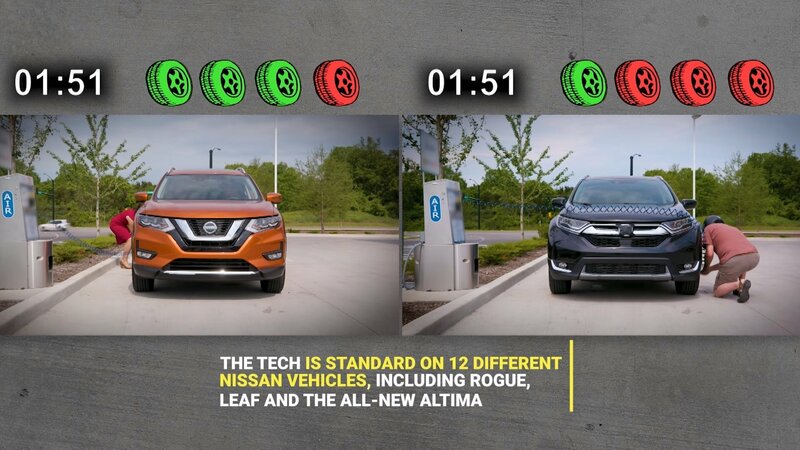 Nissan claims this system will help consumers save money as underinflated tires can rob you of gas mileage and shorten the life of your tires, but is a system like this even necessary? No, it isn’t. It’s ridiculous, actually. It’s not hard to pull out your old pressure gauge and check your tire pressure. Most air pumps even have a built-in gauge to make life even easier. All this system does is prove how lazy we as consumers can be. Sure, it’s a cool novelty I guess, but it’s an outrageous technology that we really don’t need. Oh, it does cut down the time it takes to fill underinflated tires by half, but you know that’s about 30 seconds of your life once a month or so at best. Nissan released the Altima as a compact four-door sedan back in the early ‘90s, updating it to a mid-size model in 2001. The latest sixth-generation vehicle debuted at the New York International Auto Show earlier in 2018, and now, the Japanese automaker is offering a limited-run variant dubbed the Edition ONE. Designed for “early adopters” who love their tech and “value exclusivity,” this Altima comes with a few nice touches to help it stand out from the crowd. Continue reading to learn more about what makes the Nissan Altima Edition ONE special. The Altima name goes back to the mid-1980s when it was used on a top-trim line of the Nissan Leopard and the Central American version of the Laurel. It became a stand-alone marque in 1992 when it replaced the Stanza in the U.S. Built in Tennessee starting with the 1993 model year; the Altima became one of the brand’s most successful vehicles in North America. To meet the high demand, Nissan is now building the sedan in two U.S. plants. With annual sales of more than 250,000 units during the past seven years, the fifth-generation is by far the most successful version of the Altima. But the current sedan is being phased out as we speak, with a new model set to be unveiled at the 2018 New York Auto Show in April. Redesigned from the ground up, the sixth-generation Altima will employ a new design language based on the Vmotion 2.0 concept car from 2017. 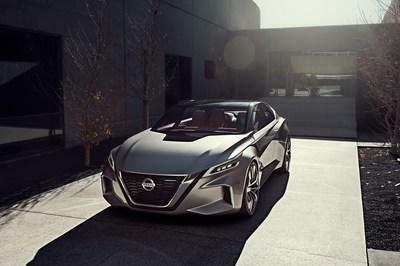 The actual styling is still a mystery though, as Nissan released only one teaser as of this writing, and the said rendering doesn’t seem to have too much in common with a production model. The redesign is also supposed to introduce a new interior with more premium features, new technology, and revised engines under the hood. 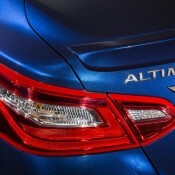 Stay tuned for updates from New York and keep reading to find out what we already know about the upcoming Altima. Continue reading to learn more about the Nissan Altima. The all-new sixth generation of the Altima will make its world debut at the 2018 New York International Auto Show (NYIAS) on March 28. With just a rendering that shows a concept-style front end and some of the profile, it’s really difficult to paint a picture here. 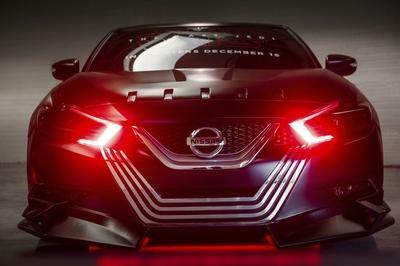 One thing to notice is that the teaser photo actually shows a rendering that’s heavily based on the Nissan Vmotion 2.0 concept that we saw at the 2017 Detroit Auto Show. 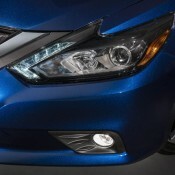 The Altima teaser sports the same big V-motion grille flanked by slender headlamps, as well as an aggressive bumper with big vents. The grille and the bumper are clearly inspired by the concept car, although the latter doesn’t have a honeycomb mesh and it’s shape is somewhat trapezoidal shape. The headlamps are similar in terms of shape and size, but the LED pattern is much simpler, being shaped like an angular hockey stick. Note: current Nissan Altima pictured here. Moving onto the sides, we can see more similarities between the Vmotion 2.0 concept and the Altima rendering, starting with the beltline that flows from the edge of the headlamp and moves all the way to the C-pillar. There’s even the heavily sculpted side skirts, but they’re not as aggressive as on the concept car. The swept up design of the C-pillar is present here as well as a modern interpretation of a design feature seen on most current Nissans. Now that we’ve compared the rendering and the concept car, it’s time to conclude that we still don’t know nothing about the upcoming Altima. The production model won’t look anything like this rendering, even though some design cues will make it on the sedan. We could see a similar beltline and glasshouse design and even a similar engine hood, but the bumper won’t be as aggressive. The headlamps will most certainly look a bit different, while the grille won’t be as big. It’s hard to tell what the Altima will look like on the inside with no photos or renderings available, but the redesign should bring a brand-new configuration and an updated tech package. Although not bad given the segment and the price tag, the interior of the current Altima needs a serious makeover. Nissan needs to get rid of the cluttered center stack and add a much larger infotainment system. An all-digital instrument cluster would also be nice, at least in the more expensive trims. I’d also like to see a more modern steering and a center console that doesn’t look like a big hunk of plastic. Tech-wise, it should get Nissan’s latest infotainment and navigation systems, as well as Apple CarPlay and Android Auto. The Zero Gravity seats should get a makeover too with heavier bolstering and new, softer materials. Higher trims will probably get leather upholstery and colored accents on the steering wheel, door panels, and the seats. The new generation should also offer increased legroom and shoulder room for both first and second-row passenger. The trunk is likely to grow as well. 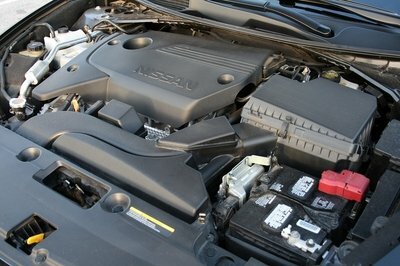 Note: current Nissan Altima engine pictured here. Drivetrain information is not yet available, but there’s a big chance that the upcoming Altima will continue with the existing engines, so expect the sedan to be offered with a 2.5-liter four-cylinder unit and a 3.5-liter V-6. Both engines will likely arrive with significant upgrades, but the displacement and cylinder layout will remain the same. The 2.5-liter four-pot cranks out 179 horsepower and 177 pound-feet of torque in the current configuration. The revised internals will a bit of extra oomph, but don’t expect anything beyond the 200-horsepower mark. Fuel economy should also improve, so expect more than the current 38 mpg highway and 27 mpg city. Next up is the 3.5-liter V-6, a mill that’s rated at 270 horsepower and 251 pound-feet of torque in the current sedan. I’d say that this engine will get close to 290 horses with all the updates, but the increase could be smaller is the new Altima loses a lot of weight. Fuel economy should increase by a couple of mpgs over the current 32 mpg highway and 22 mpg city. 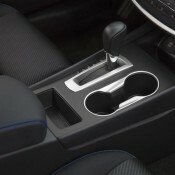 A revised Xtronic CVT transmission should replace the current unit. 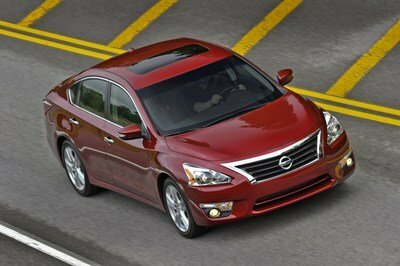 The Altima will continue to be a front-wheel-drive model. Whether AWD will become an option is still a mystery. As with all new-generation models, a price increase is to be expected here. 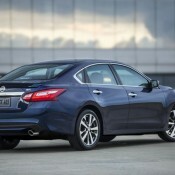 The current Altima retails from $23,260, so the new sedan could start from around $25,000. Pricing for the range-topping model could increase from $33,630 to around $35,000. The Altima goes against stiff competition in this niche, starting with all-popular Toyota Camry. Redesigned in 2017, the current Camry has a surprisingly sporty design that borrows features from the luxury-oriented Lexus brand. Unless Nissan comes up with something really exotic, the Altima will have a difficult time against the Camry in the design department. The sedan’s new interior is equally dramatic and feels more upscale than before. The driver-centric dash and center stack. The digital instrument cluster and the premium materials are proof that Toyota no longer makes boring cars for senior citizens. Under the hood, the base model comes with a 2.5-liter four-cylinder engine rated at 203 horsepower and 184 pound-feet, while the V-6 version gets its juice from a 3.5-liter unit with 301 horses and 267 pound-feet. Unlike Nissan, Toyota also offers a hybrid model with a total system output of 208 horsepower and 312 pound-feet. 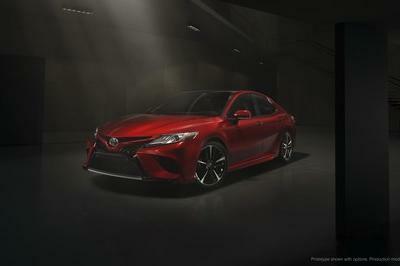 Pricing for the new Camry starts from $23,495, while the V-6 model comes in at $34,400. The hybrid version retails for $27,800. Read our full review of the 2018 Toyota Camry. The Accord is yet another big name in this niche and the only midsize that threatens Toyota’s supremacy in this segment. Much like the Camry, the Accord got a massive makeover in its latest generation. Introduced in 2015, the current Accord is sportier, more elegant, but also a bit larger for a more upscale look and roomier interior. The Accord’s cabin might not be as sporty as the Camry’s, but it has a straightforward, simple design that’s pleasing to the eye. All models come with the Multi-Angle Rearview Camera and Expanded View Driver’s Mirror, while the Touring trim gets auto high-beam headlamps, a first for the Accord. Apple CarPlay and Android Auto were also introduced on the latest model. The range begins with a 2.4-liter four-cylinder engine that generates 185 horsepower and 181 pound-feet. While not as powerful as the Camry, this model probably has what it takes to give the new entry-level Altima a run for its money. Moving over into V-6 territory, Honda’s 3.5-liter unit is good for a solid 278 horses and 252 pound-feet of torque. A hybrid model is available as well. Pricing starts from $22,455 and goes up to $30,920 for the range-topping model. The hybrid comes in at $29,605 before options. 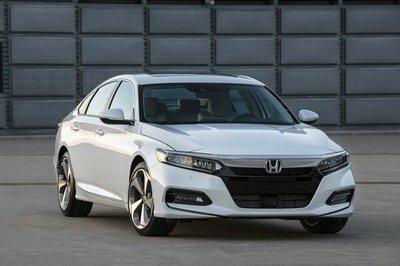 Read our full story on the 2018 Honda Accord. It’s hard to tell how the new Altima will do on the market with next to no official info available yet, but we know for a fact that Nissan wants to launch a solid midsize sedan at the New York Auto Show. 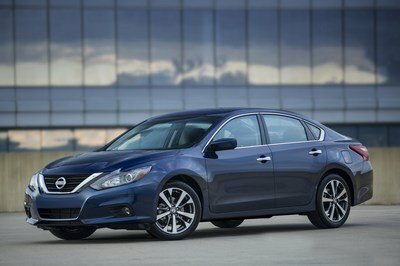 The Altima has been doing really well in the U.S. in recent years with sales of more than 300,000 units per year and Nissan doesn’t want to screw up. 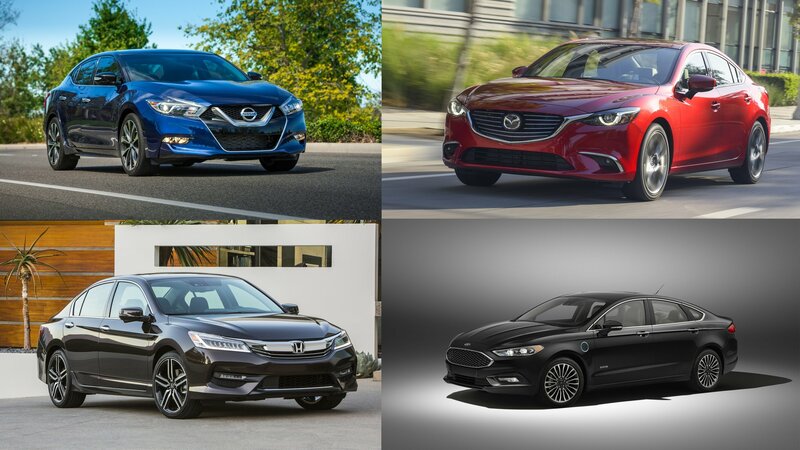 If things go well, the Altima may finally have a shot at climbing above the Honda Accord, but it all depends on what the new sedan has to offer. And we will find out more about that at the 2018 New York Auto Show next month. Read our full review on the 2017 Nissan Altima. Read more New York Auto Show news. The Nissan Altima is going to make its debut at the 2018 New York Auto Show. We already know that much after Nissan released a teaser video a month ago. The Japanese automaker isn’t just stopping there, though. 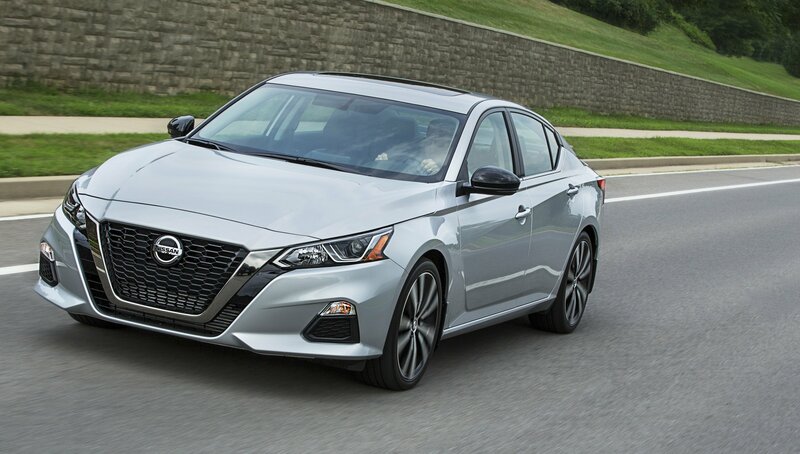 It also unveiled a sketch of the new model, complete with exaggerated design cues that suggest that the Altima will receive its share of stylistic updates. 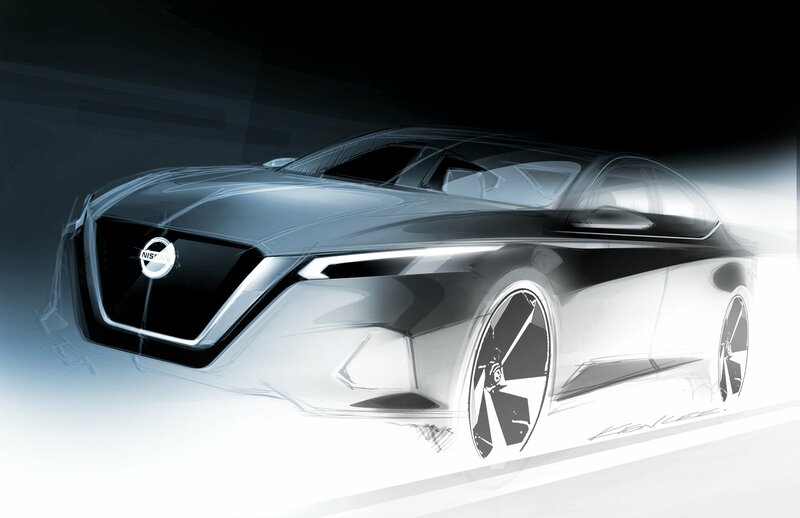 The sketch itself doesn’t reveal much — there’s no sign of the sedan’s rear section — but it does show what we can expect from Nissan’s design language for future sedans. The massive V-Motion grille is clearly visible. So are the thin headlights. The front cutouts are less visible, but you can still see them if you look a little closer at the sketch. The side profile also shows muscular-looking body lines, including one that cuts aggressively in the lower section of the car. All these observations don’t mean that this is the same car we’ll see when the Altima debuts in New York, but the sketch does offer concrete indications of what the new sedan is going to look like. Given a choice, we’d like to think that the real Altima is going to look a lot like this sketch. Unfortunately, the sketch is the only concrete thing we can use to speculate on the new Altima. There’s no information yet from Nissan regarding powertrain options, though we do suspect that at least one of these options will come in the form of an efficient turbocharged engine that’s similar to the V-6 unit Toyota currently employs on the Camry. A hybrid engine is also possible considering where the segment is heading these days. 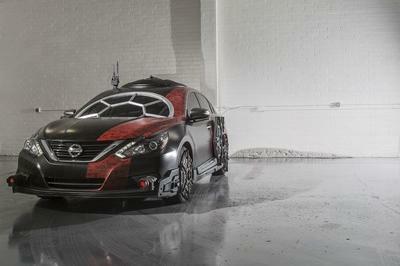 And for what it’s worth, we’re hoping to see Nissan outfit the Altima with its ProPilot Assist safety technology. For now, all of this is subject to speculation. 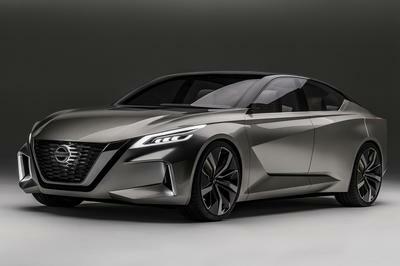 Nissan could very well have a few surprises up its sleeve when the sedan makes its debut in New York later this month. We’ll know soon enough what Nissan has in store for us with the new Altima. For now, keep looking at the sketch. Maybe you’ll see something we missed. In case you didn’t know, Nissan is bringing a new Altima sedan to the 2018 New York Auto Show. The automaker made that abundantly clear when it released a new teaser video featuring the Empire State Building. So that’s happening. 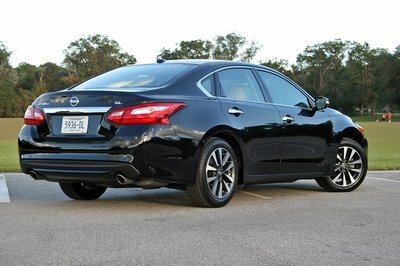 What’s less certain is our expectation of what the new Altima is going to be. Either way, save the date for March 28. The new Nissan Altima is on its way. Sedan’s might be on the decline in the U.S., but they still pull in heavy sales. The Altima, for example, sold 254,996 units in 2017. That’s a big total, even if it was down from its record sales year in 2014 when Nissan moved 335,644 units. Nissan still has big plans for its mid-size sedan, and we’re going to see the sixth-generation model when it hits the Big Apple in a little over a month’s time. The teaser video didn’t reveal much, but don’t expect anything groundbreaking out of the new Altima. It should still receive a four-cylinder engine as a base powertrain. The likely candidate would be the same 2.5-liter four-banger that was used in the last model. Don’t be surprised, though, if Nissan opts to switch things up for the sixth-gen model. A 3.5-liter V-6 unit is also likely given the fact that the Altima has always had a version of that engine. Likewise, a hybrid version should also be in the cards. The sedan will also sport a front-wheel drive setup, but rumors have circulated that an all-wheel-drive system could be thrown into the mix as an option. The design of the sixth-generation Altima is open to interpretation. 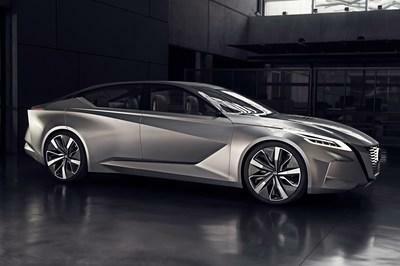 We’ve seen prototype versions go on test runs in the past few months, but there’s growing belief that the new Altima will adopt styling cues from the Nissan Vmotion 2.0 Concept that the automaker unveiled at the Detroit Auto Show last month. It’s not likely to be as dramatic as the concept, but the Vmotion 2.0 is a good peg for the Altima if it’s really going to make a statement in its super competitive segment. More details should arrive as we draw closer to the New York Auto Show. For now, check out the Vmotion 2.0 Concept and imagine how it’s going to look like as the sixth-generation Altima. Intriguing, right? The Los Angeles Auto Show is the perfect occasion for carmakers to launch their late-in-the-year models for the U.S. market, but Nissan decided to go with something different in 2017. Having signed a collaboration with Lucasfilm for the upcoming “Star Wars: The Last Jedi” movie, the Japanese automaker unveiled no fewer than six Star Wars-themed concept cars. 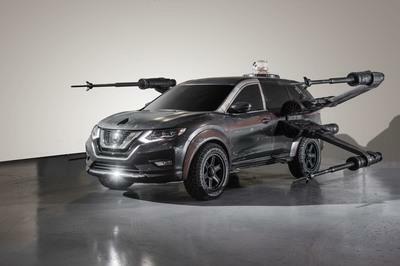 Each of them is based on characters and crafts from the upcoming film, set to debut on December 15, and are built around Nissan’s most popular models in the U.S., the Rogue, Rogue Sport, Altima, and Maxima. The vehicles were developed at the Lucasfilm studios, where artists penned everything from the design, colors, textures, and graphics, all inspired by the Star Wars franchise. The sketches were then brought to life using hydro-dipped graphics and aged exterior design to show simulated use in battle. 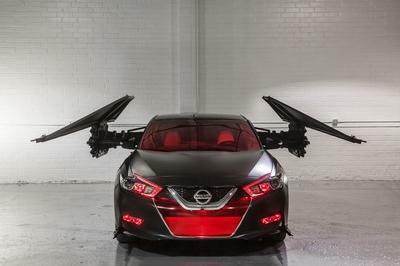 Don’t worry; you won’t be seeing any flying Nissans in the movie, but also don’t expect any of these concepts to make it into production. Let’s have a closer look at each of them below. The first car on the list is based on the strike fighter used by the First Order’s elite pilots. It features a multi-paned windshield, special wheel covers, all sorts of weapons front and rear, and a custom paint job with an offset red stripe. This vehicle looks much more sinister than the previous one, and that’s because it was designed to mimic Kylo Ren’s black and silver face mark. The V-motion grille was rebuilt from a single block of milled aluminum, while the new lower spoiler appears to be taken off a full-fledged race car. The headlamps have red signature lighting that matches the underbody lighting. Both pulse at random to mimic Kylo Ren’s crossguard lightsaber. Also inspired by Kylo Ren, this sedan is finished in black and equipped with red lighting in the bumper, as well as inside the cabin. It has two massive wings on each side, which are fitted with laser cannons and missile launchers. It also has sound effects pulled directly from the movie, but no video (or audio) is available yet. The Captain Phasma sedan sports an interesting livery with a gloss-black upper half and a high-gloss silver lower half, separated by a red stripe. The front end was designed to mimic the mask of the female character and makes the sedan look like an armored vehicle. The six little vents on the lower front doors make for a particularly interesting detail that somewhat reminds me of GTE-spec race cars with side-exiting exhausts pipes. BB-8 astromech droid with functioning lights, motion, and sound. A rugged tire and wheel package complete the look and turns the crossover into a vehicle ready for battle. Not as aggressive as the X-wing, the A-wing is closer to the standard-spec Rogue Sport. Just ignore the dual thrusters and the roof-mounted fins, and it looks like a regular crossover with a two-tone paint job with battle scars. However, the illuminated thrusters and the laser cannons mounted on the rear fenders give it a proper Star Wars-inspired look. 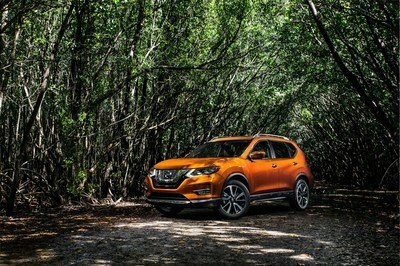 Read our full review on the 2017 Nissan Rogue. 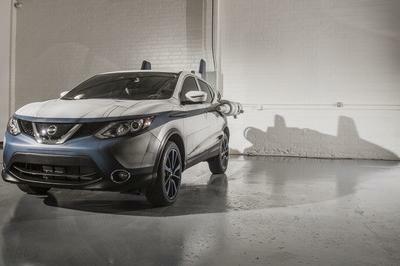 Read our full review on the 2017 Nissan Rogue Sport. Read our full review on the 2017 Nissan Maxima. In a day and age where add-on packages and accessories have become commonplace in the auto industry, Nissan is doing its part to ensure that its customers are taken cared of in that regard. 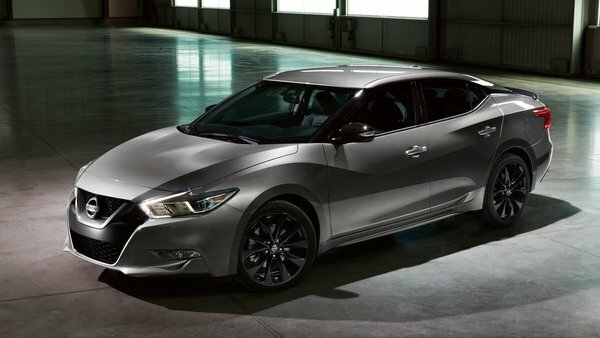 The Japanese automaker unveiled its Midnight Edition package last year on the Maxima sedan and after incessant public demand. 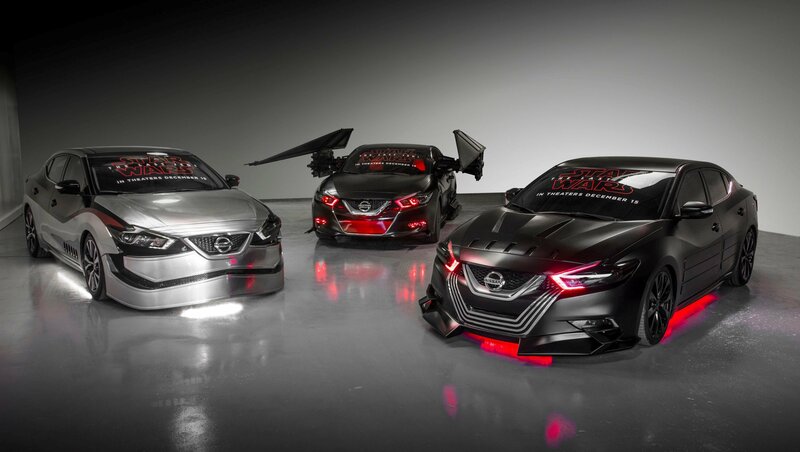 In fact, 85 percent of Maxima SR sales come with the Midnight Edition package. 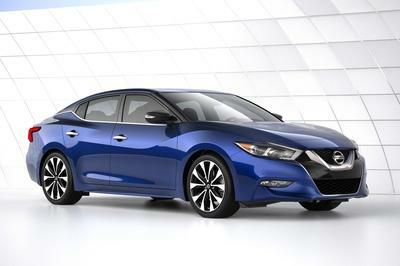 Nissan is now expanding the availability of the package to six of its current models, including the Maxima. Together with Nissan’s full-sized sedan, the Midnight Edition package is now available on the Altima, Murano, Pathfinder, Rogue, and Sentra. Naturally, the specific changes vary depending on the model. The Sentra, for example, gets a set of 17-inch wheels as opposed to the Pathfinder, which finds itself on the receiving end of a bigger set of 20-inch wheels. But by and large, the blacked-out theme of the package remains consistent across all models. Prices also vary depending on which model is getting the package, although for the most part, Nissan’s keeping the extra costs relatively affordable as the most expensive versions of the package. 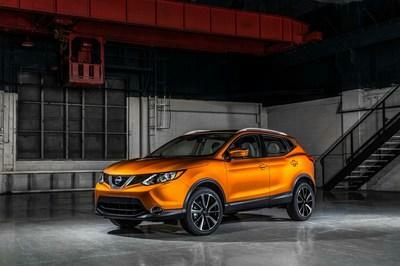 The ones for the Altima, Murano, and Pathfinder all cost $1,195. The expanded Midnight Edition package is making its debut at the 2017 Chicago Auto Show. And with the exception of the Rogue Midnight Edition, all other editions are already on sale. The package for the Rogue will be available beginning in March 2017. The Nissan Altima was originally sold in the U.S. in 1992, and in 2001, it made the transition from compact to mid-size sedan. Considered one of the top entries in its segment, the Altima offers easy driving characteristics, a comfortable cabin, exciting performance, and high value. These assets have propelled the Altima to the top of Nissan’s sales charts, but throughout its five generations, it’s lagged behind similar products from Toyota and Honda. 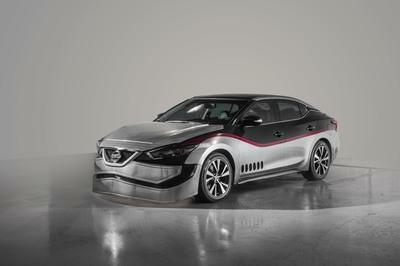 Nissan hopes to change that for the 2016 model year, giving the Altima “one of the most extensive mid-cycle product makeovers in Nissan history,” according to North America chairman José Muñoz. The changes are indeed quite dramatic, including a redesigned exterior and cabin, class-leading fuel efficiency, active safety technology, updated suspension, and the introduction of a sportier SR trim level. But is it enough to nose ahead of the competition? I went to Plymouth, Michigan to find out. Located roughly 30 minutes west of Detroit, Plymouth is crisscrossed by long country roads, meandering two-lanes, and charming townships, offering a nice mix of environments to put the new Altima through its paces. I also got a chance to test out the new suspension on a parking lot slalom course and rough road course. Continue reading to learn more about the 2016 Nissan Altima. 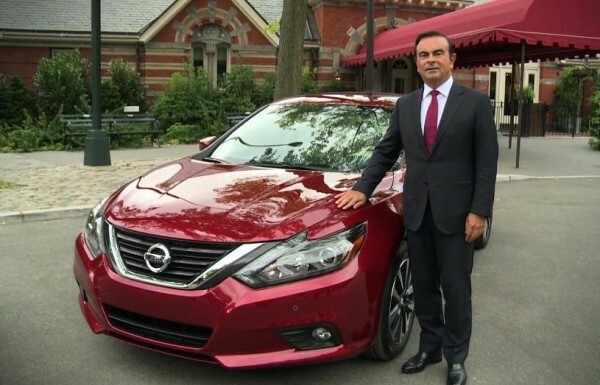 Renault-Nissan CEO Carlos Ghosn travelled all the way to New York City to unveil a brand-new model he believes is going to reinforce their position in the mid-size sedan segment. The model in question here is the 2016 Nissan Altima and it comes with new looks, interior, and features. Adapting the firm’s latest design language found on the Murano and Maxima, the 2016 Nissan Altima looks quasi-aggressive with its new fascia, bumper, fenders, hood and lights. The SR version of the sportiest of the lot with sculpted accents and spoilers, smoked headlight bezels, and integrated LEDs. This design philosophy is called “Energetic Flow” and it is complemented with Gliding Wing” interior layout. 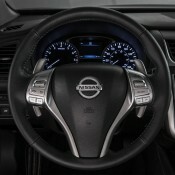 Highlights of the interior include 5.0-inch and 7.0-inch displays for the NissanConnectSM with Mobile Apps and available NissanConnect Navigation with Mobile Apps, woven cloth seating and door panel materials, twin cup holders, blue sport interior accents on the steering wheel, door panels and seats, and leather-wrapped steering wheel, paddle shifters, and leather-wrapped gear shifter in the SR models. 2016 Nissan Altima is available in a choice of seven models – 2.5, 2.5 S, 2.5 SR, 2.5 SV, 2.5 SL, 3.5 SR and 3.5 SL. The five 2.5-liter models feature a 182-horsepower 2.5-liter DOHC inline 4-cylinder engine, while 3.5-liter Altimas offer a 270-horsepower 3.5-liter DOHC V6. The car will hit the showrooms in November. 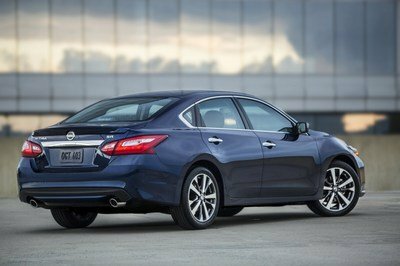 The post Official: 2016 Nissan Altima appeared first on Motorward. 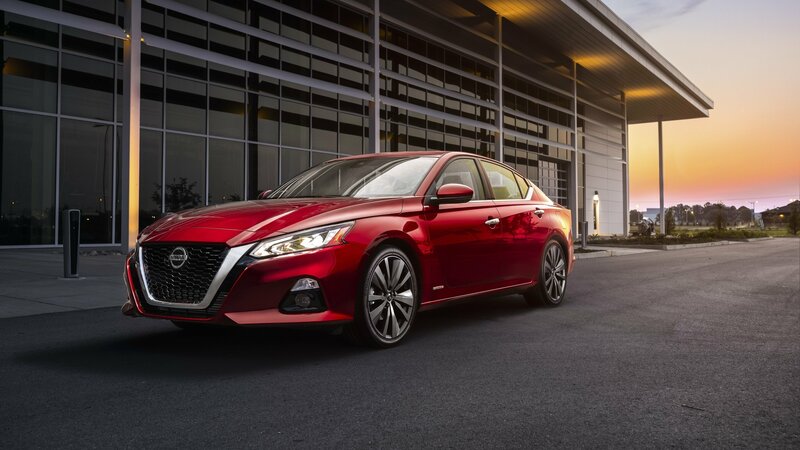 Redesigned for the 2013 model year, but built on the same Nissan D platform, the fifth-generation Altima, marked the beginning of a successful era for the Japanese automaker in North America’s crowded midsize segment. After lagging far behind both the Toyota Camry and the Honda Accord, the Altima started to gain on its rivals, eventually outselling both of them in the final month of 2014. The fifth-gen car was well received, being praised for its smooth and quiet ride, comfortable seats, well-crafted interior and for being quite entertaining on twisty roads. Its strong fuel economy, a particularly important feat in this segment, also helped it gain a massive amount of followers. 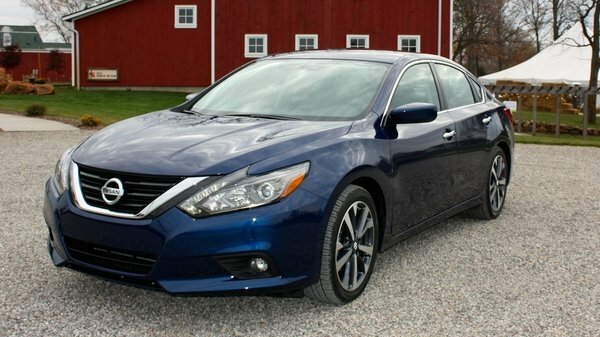 Come 2015, Nissan is already looking for ways to cement the Altima’s excellent reputation by ways of substantial refresh for the 2016 model year. 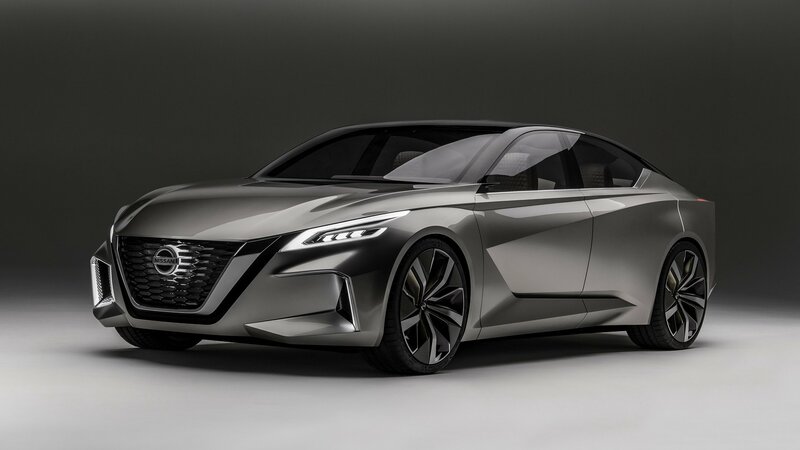 The news comes straight from Pierre Loing, Nissan North America’s vice president of product planning, who revealed to Auto News that the fifth-gen Altima is in for styling changes and technology improvements. Although he stopped short of disclosing actual details, Loing said the update would follow Toyota’s extensive facelift to the 2015 Camry. “Camry did something very huge. I believe they did that probably because they thought the car was not where they wanted it to be. I’m not sure we’re going to go to that extent. 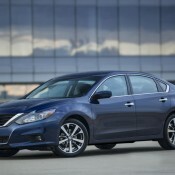 But we’re going to do something significant for the Altima for the mid-cycle,” Loing noted. Click past the jump to read more about the 2016 Nissan Altima. 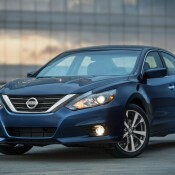 Nissan Altima originally appeared on topspeed.com on Tuesday, 27 January 2015 11:00 EST.